It has been missing for over fifty years, thought to have been destroyed by the Blue Meanies. It's damaged, old, rusty but there's no mistaking the Yellow Submarine! The Blue Meanies are back and they have set the countdown to missile launch. Pepperland is under siege. Only you can stop them! 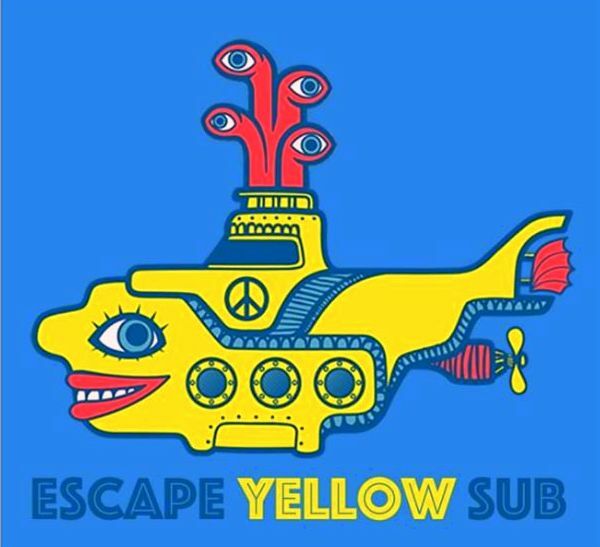 Escape Yellow Sub is described as an escape game for Beatles fans and anyone looking for something different. 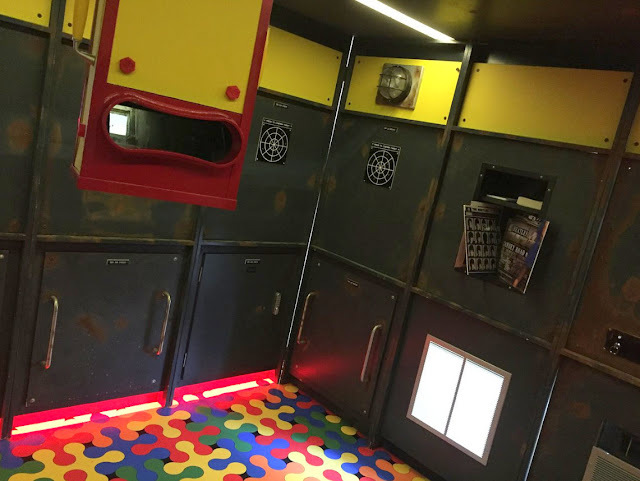 If you’re new to escape rooms (as we all were) it’s worth providing some explanation. 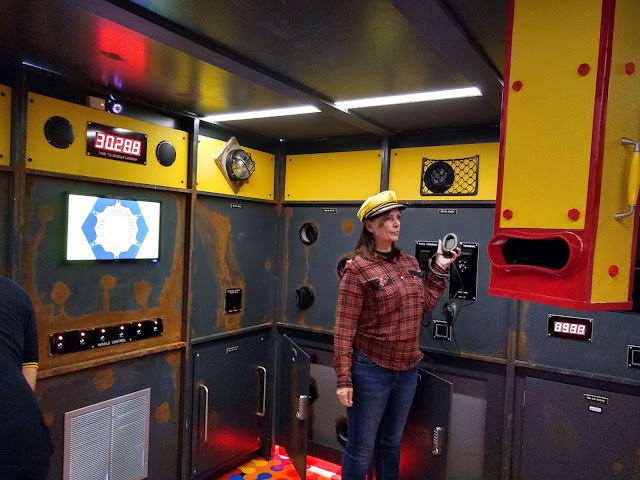 An escape room (sometimes called an ‘escape game’) is a physical adventure game in which players solve a series of puzzles and riddles using clues, hints, and strategy to complete the objectives at hand. 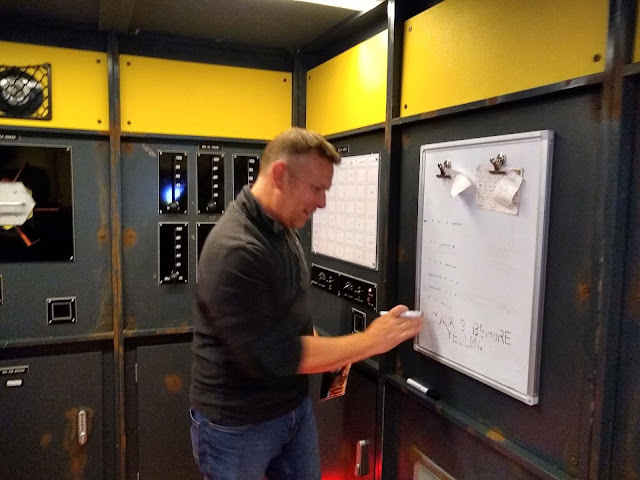 The escape room might consist of a large, single room or span across multiple rooms, players unlocking clues in the first room to gain access to the second, and so on. The catch of course is that players are given a set time limit to complete the challenges allowing them to escape the room, and therefore ‘win’. The games are set in a variety of fictional locations such as prison cells, dungeons, space stations etc and the various puzzles follow the theme of the room. No prizes for guessing the theme of our escape room! Sometimes the backstory of the room is told by the Game Host or alternatively on a pre-game video. This format of a room or area containing puzzles and strategies which have to be solved by teams of contestants has featured in several TV game shows such as the Crystal Maze, The Adventure Game, Fort Boyard and Knightmare. There are also versions available for games consoles. And so we found ourselves on a pavement in Slater Street, outside a doorway over which a bright yellow cube was suspended displaying the number nine, number nine, number nine, number nine... sorry. The first problem we had was we couldn’t figure out how to gain access to the building. This didn’t bode well for our problem solving abilities. Was this the first test?! Solving the first puzzle simply by pressing the intercom we were welcomed by Alex our Game Host who invited us into a small darkened annexe room with suitably psychedelic lighting. Alex took us through some health and safety procedures before setting the scene with some flair and humour, and plenty of Beatles’ puns. 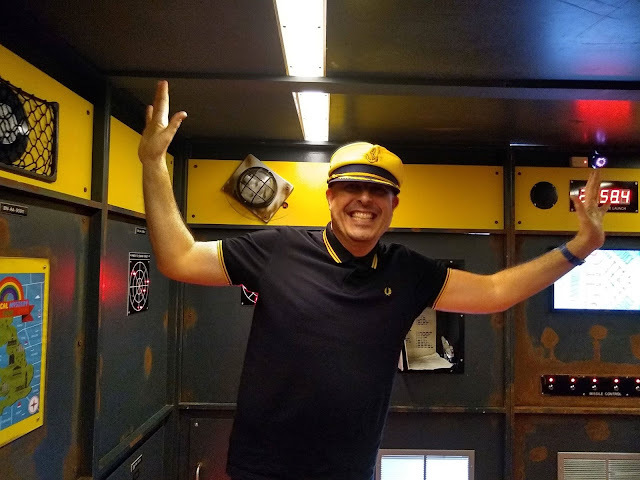 After inviting us to don some suitable Submariner’s headgear he warned us that there was nothing in the room that required great physical strength although there were plenty of buttons to be pressed and levers to be pulled. Great, I thought, we're all Lever-pullers born and bred, this will be easy! The plot, such as it is, involves the Blue Meanies seizing control of the Yellow Submarine and launching six missiles. Our job was to solve the puzzles and find the six keys which would enable us to abort the launch. If we failed the Earth as we knew it would cease to exist. It was time to save the world. No pressure then! We climbed through the yellow painted hatch into the submarine control room. The hatch door locked behind us and we could suddenly hear Alex on the intercom. Almost immediately a red count-down clock began started counting down. We had 50 minutes. Looking Like This, how could we fail? The challenge itself takes place in one submarine themed room. 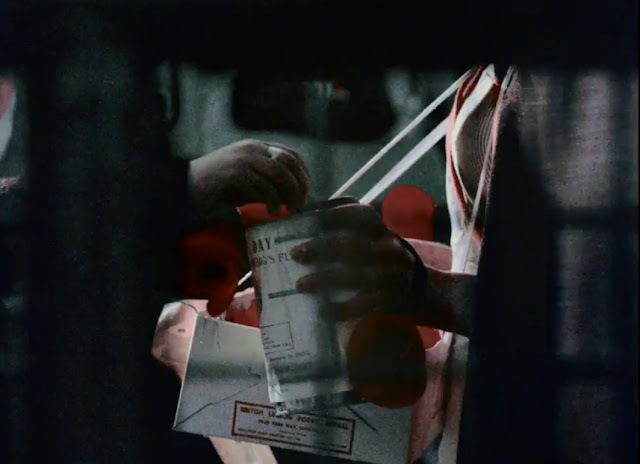 There are nods to the Beatles in parts such as the vinyl albums (a clue maybe?) and the names of some of the nautical vessels on various documents. Did being Beatles’ fans help? We thought we would definitely be able to “work it out” but time moves quickly in Pepperland and we found the puzzles were only loosely based on the Beatles, so we had no real advantage over anyone else attempting the challenge. The Blue Meanies had hidden the keys pretty well and their puzzles were varied and required some logical thinking. There were tasks involving morse code, mirrors, magnifying glasses and one which required simple dexterity (which I appeared to have lost). Team work was essential. We only managed to find 4 out of the 6 keys by the time the countdown reached the 50 minute mark and the lights went off. However , to our surprise Alex informed us we had been more successful than most groups. Mind your heads on that periscope! Whilst we were annoyed with ourselves for not completing the task (perhaps we would have managed with an extra 10 minutes) we agreed this had not spoilt the experience. 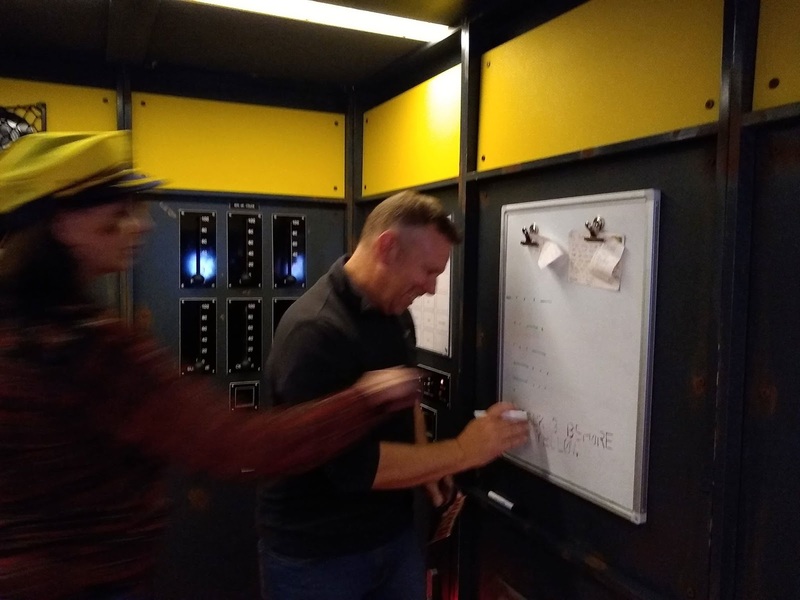 It was great fun and as we were all new to escape rooms we agreed we would like to try more, either the Yellow Sub again or a different themed game. Great fun for 2 to 5 players. Highly recommended and a great way to spend an hour. After that, there was only one way to go out. Escape Yellow Sub is at 151 Slater Street Studios, 9 Slater Street, Liverpool 1. Paul McCartney's Penny Lane was released 52 years ago today as a splendid double-A side single with John Lennon's equally excellent Strawberry Fields Forever. Arguably the Beatles best single it was somehow kept off the top of the pop charts by balladeer Engelbert Humperdinck's mega-hit Release Me. Enough said about that the better. 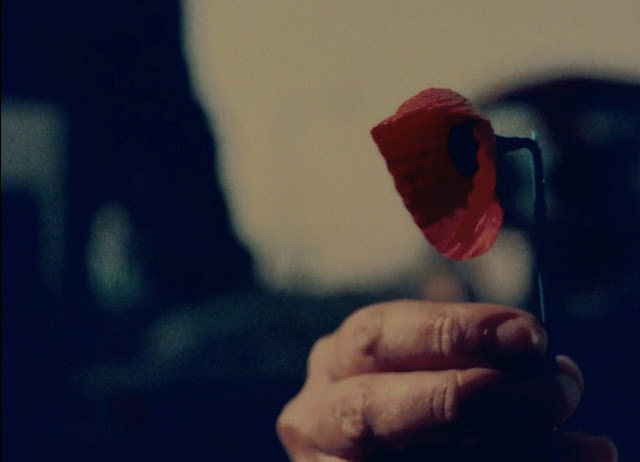 Promotional films were shot for both sides of the single. As the Beatles were in the middle of recording the Sgt. Pepper album they were reluctant to take time out to journey up to Liverpool. Instead, the street scenes including the Beatles were filmed in and around Angel Lane in London's East End. The solo sequences featuring John walking were filmed on the Kings Road (at Markham Square, Chelsea). The additional scenes where the Beatles are wearing red huntsman's jackets, riding horses and sitting at a circular table while bewigged assistants serve them their instruments were filmed at Knole Park in Sevenoaks. The entire film for Strawberry Fields Forever was shot in the same location at the same time. The film crew then travelled up to Liverpool for some location filming, including the shelter in the middle of the roundabout, shot by Tony Bramwell from the top of St. Barnabas' Church tower. This film features all the characters in the song and is a far more literal adaptation than the Beatles' more surreal effort. 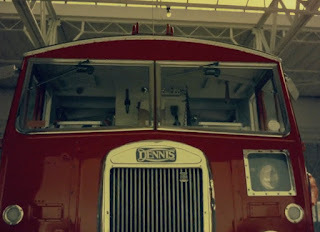 Ironically, the street scenes in this video (to represent the actual Penny Lane) were NOT filmed in Liverpool. 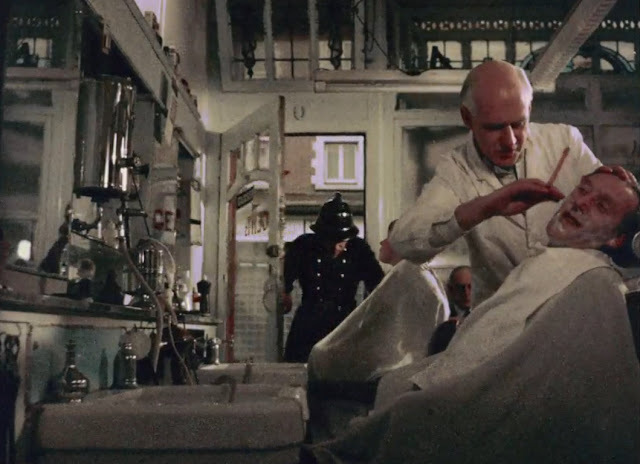 It would be great if someone with the right skills could make a new edit adding the scenes from McMillan's film which include the barber, fireman and nurse to the Beatles own, perhaps at the expense of the Knole Park scenes. Any volunteers? Then the Fireman rushes in, from the pouring rain. Very strange. 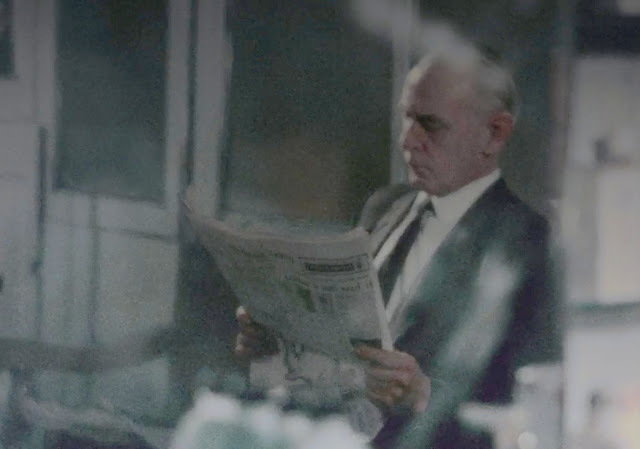 If anyone has any information as to why McMillan's film was made please get in touch. Note: Ian McMillan should not be confused with Iain Macmillan who shot the cover photo for the Abbey Road album. 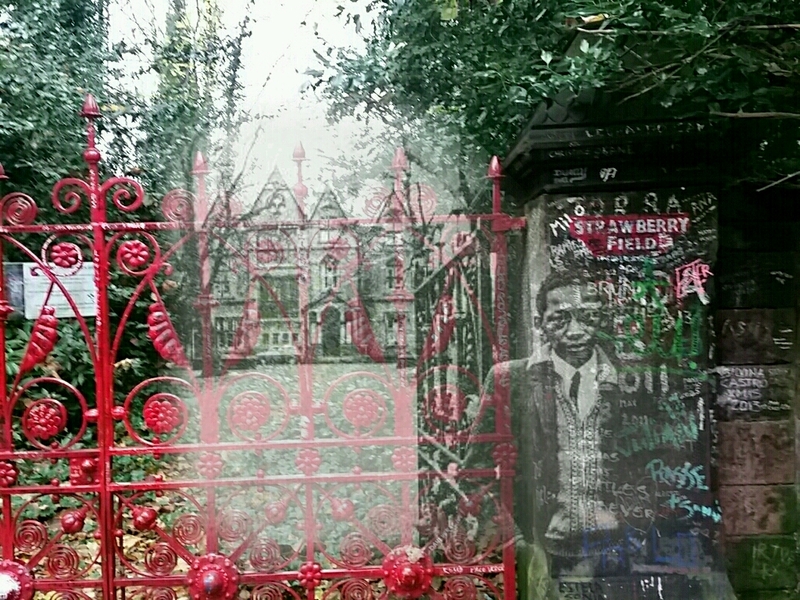 John Lennon: There were two famous houses in Woolton. One was owned by Gladstone: a reformatory for boys, which I could see out of my window, and Strawberry Field, just around the corner from that, an old Victorian house converted for Salvation Army orphans. The earliest reference to the Gothic Revival mansion 'Strawberry Field' dates from 1870, when it was owned by one George Hignett Warren (1819-1912), a wealthy shipping magnate. On an 1891 Ordnance Survey map the building and its grounds appear as the plural 'Strawberry Fields', although this had changed by the 1905 survey. George Warren's daughter Mary Swire put the mansion up for sale in 1914. The advert below gives a good idea of the amenities within the house and surrounding grounds. 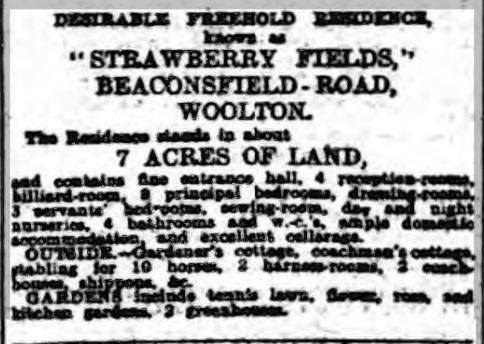 For sale in the Liverpool Daily Post, listed on 17 and 19 June 1914. 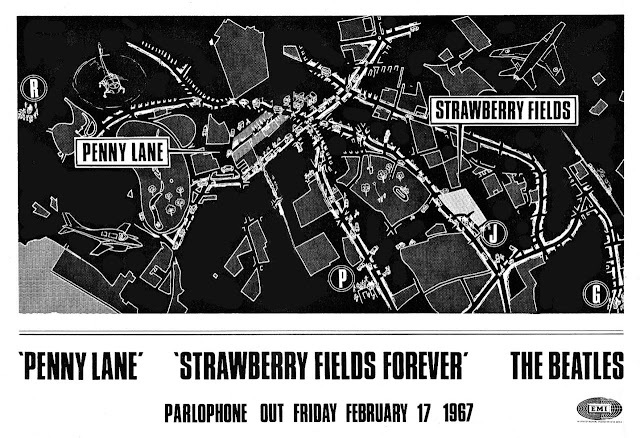 Note it's Strawberry Fields again. It was acquired by Alexander Cameron Mitchell (1844-1927), another wealthy merchant who at that time was living in Weston House, Halewood. Mitchell's widow sold the estate to the Salvation Army in 1934, a few years before her death in 1940. 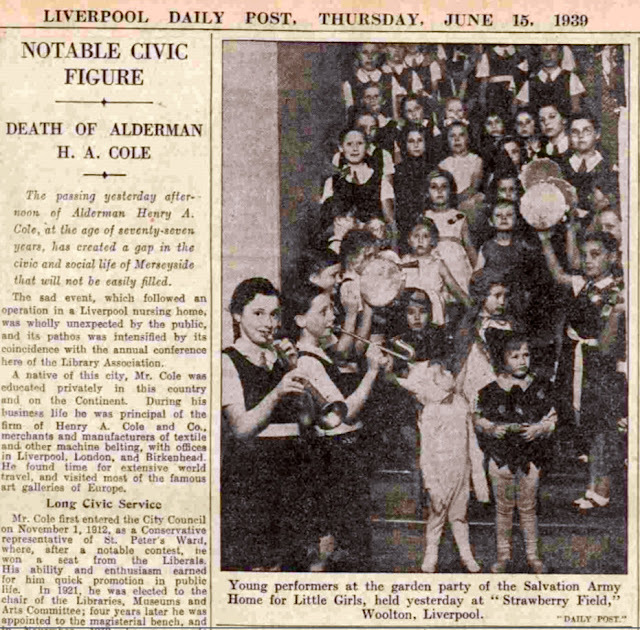 It was opened as a children's home for young girls on 7 July 1936 by Lady Bates in the presence of General Evangeline Booth, daughter of the Salvation Army founder. With a capacity of up to forty girls, boys under 5 were introduced in the 1950s. Later still, older boys also became resident. The home took children between the ages of 3 to 16 at which point they would either return them to their parents or help place them in a job. Despite the name on the famous gateposts it continued to be referred to as Fields in local conversation, in newspapers and by its young residents (and even in some Salvation army paperwork). 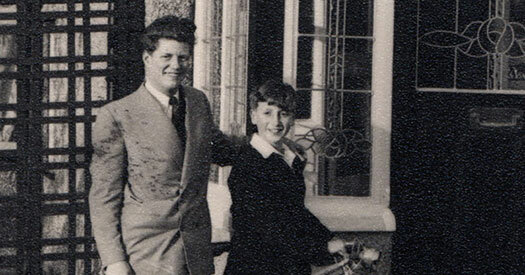 This was not a borstal - these were not bad kids and, contrary to John Lennon’s belief, they were not generally orphans – the children were there for the mistakes their parents had made (from what you'd call 'broken homes' back then) and the home gave them a refuge from turmoil and unhappiness for nearly 70 years. As a result the children were never locked in. The gates to the road were always open and everybody attended local schools and were free to come and go in the local area. The children called themselves 'Strawbs' and were a familiar site in Woolton village. In ‘Tune In’ author Mark Lewisohn writes that it may have been because of her sister Julia’s past predicaments that Mimi supported the Salvation Army’s residence for children from broken homes, after all, she had such a child living with her at ‘Mendips’. I’d be interested to know whether Mark based this on comments made by Mimi later in her life, when she was guilty to some extent of re-writing her history, especially where John was concerned. 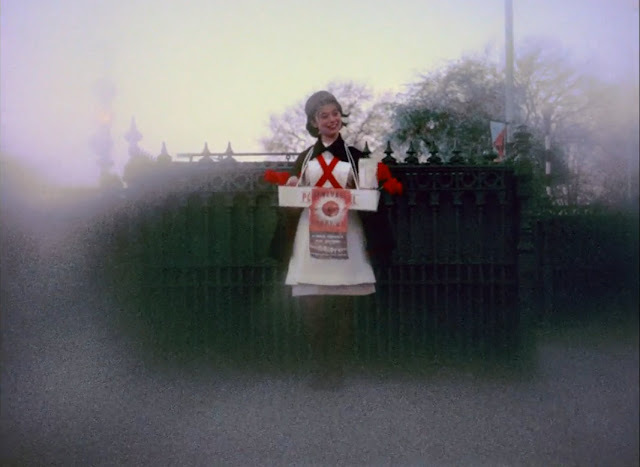 It’s true that she took John to the annual garden fete at Strawberry Field, telling the author Hunter Davies (after the release of the Beatles’ 1967 single) that 'as soon as we could hear the Salvation Army Band starting, John would jump up and down shouting "Mimi, come on. We're going to be late” so yes, she supported the home to some extent by buying the tickets, but what did she really think of the children who lived there? We would sneak over to the Salvation Army Home grounds through the back of ‘Mendips’ to play with the children of the Home, much to the annoyance of Mimi. She thought we should not mix with ‘those kind of children. Some sources will tell you that the phrase ‘nothing to get hung about’ in the song ‘Strawberry Fields Forever’ were inspired by Mimi’s orders not to play in the grounds, to which John would reply ‘They can’t hang you for it’. For me, I think that’s a bit of a stretch, the result of a later author's creative thinking, but who knows? 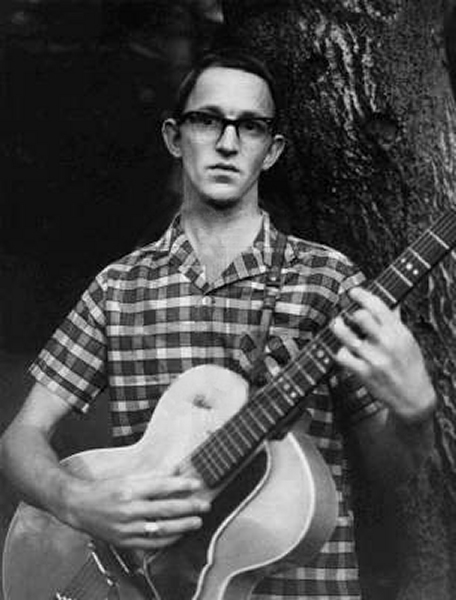 Regardless of Mimi’s views, John continued to play in the grounds of Strawberry Field, either with Stanley when he was home, or with his gang – Pete Shotton, Nigel Walley and Ivan Vaughan. They’d climb over the sandstone wall in Vale Road, sneaking through the bushes and keeping an eye out for the ‘cocky watchman’* - Mr Blaine the gardener who lived in the house behind woods, hated trespassers and would give John and his gang a good hiding, if only he could catch them. As he grew older John continued going to the annual fete, Mimi replaced by his mates. At one fete in 1955 or 1956 he managed to obtain a monk’s cowl (with hood) and wandering amongst the cake stalls, jumble sales and brass bands he dispensed holy mutterings while respectful Wooltonians bowed to him, much to the delight of Nige Walley who cherishes the memory to this day. 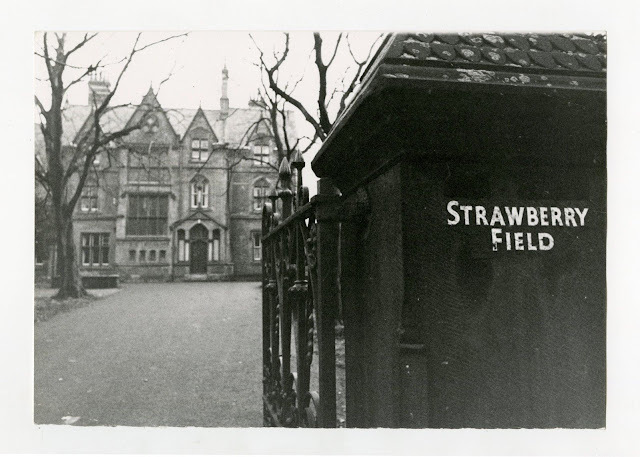 The release of the Beatles’ single ‘Penny Lane’ / ‘Strawberry Fields Forever’ in early 1967 drew attention from the press with several papers sending photographers to Woolton. One of the photos resulting from the sudden interest was this well known photo. I’ve looked at it on and off over the years and wondered who the young lad with the tired eyes was. What was his name and what became of him? Quite unexpectedly as a result of the photo being posted on Facebook I suddenly had a name for him, together with a lovely little anecdote that links both sides of the Beatles’ single. Mel Wold: This boys’ name is Francis Foster. I was in Strawberry Field children’s home at the same time. I was there from 1962 - 1972. We also had our hair cut by the girls of Bioletti’s at Penny Lane. They used to come to the home. I was only ever in this house and not the new built one, although I did visit the new home. Many memories. I used to go to Childwall C of E school and then Gateacre Comp(rehensive). Bioletti’s was of course ‘the barber showing photographs’ in Penny Lane where John and Paul had their hair cut as children. Francis Foster where are you now? I hope you had a good life. 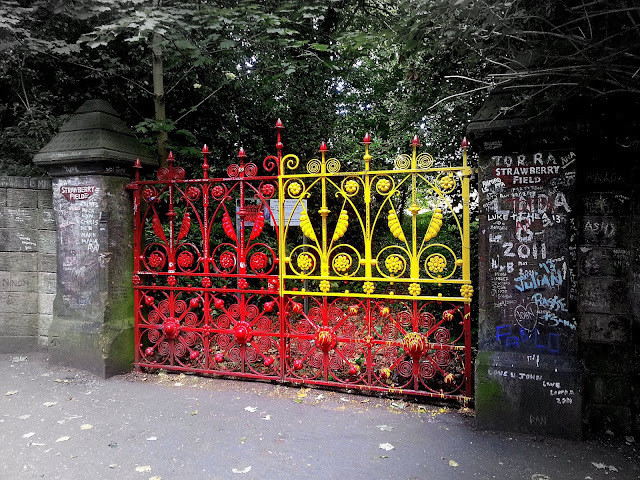 When John returned to Liverpool in June 1969 he took his new wife Yoko to visit the children at Palmerston special school, situated opposite the gates to Strawberry Field. It’s easy to imagine him crossing Beaconsfield Road for a moment with Yoko, pausing at the gates leading up to the big house and showing her the place where he used to go to escape. Of course, he never returned although there are stories that he had planned to visit the UK (and Liverpool in 1981). Had he done so he would have been dismayed to find the old mansion had gone. 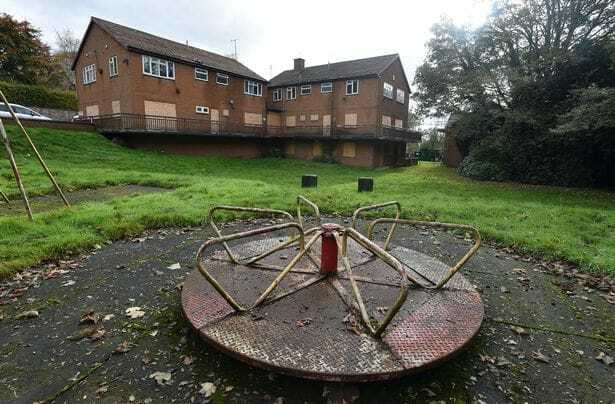 By 1973 the structural problems, including dry rot, meant that it was more cost effective to demolish the building and replace it with a new, purpose-built children's home. This new home provided three family units, each accommodating 12 children. 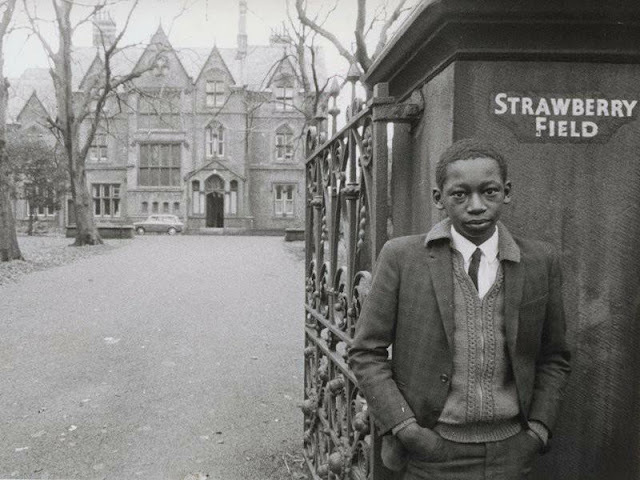 The driveway entrance to the building was moved further west up Beaconsfield Road so the gateposts bearing the name 'Strawberry Field' were no longer used. Throughout the 1970s and especially post 1980, the disused entrance and its gates became a mecca for Beatles fans from around the world. As a result, the gates continued to be painted bright red and the painted nameplates were also maintained in the face of continual vandalism from visitors who feel the need to write messages all over them. The children's home finally closed in early January 2005, and the building was used by the Salvation Army as a church and prayer centre. The famous gates marking its entrance were removed and replaced with replicas in May 2011. The second building on site from the 1970s, after closure (Liverpool Echo). The Salvation Army is planning to open Strawberry Field to the public for the first time, allowing visitors to explore the grounds. The demolition of the 1970’s buildings has made space for a new training centre for young people with special educational needs, and a new exhibition space dedicated to the story of the place and the song "Strawberry Fields Forever". Major Ray Irving, Territorial Social Services Secretary, The Salvation Army. 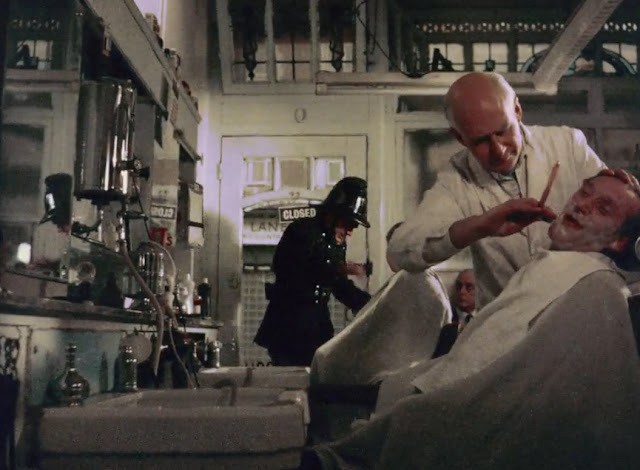 And as for the Reformatory home for bad boys? Stanley Parkes: The Bad Boys Borstal also intrigued us. That was housed in the former house and Stables that had belonged to Gladstone, the Prime Minister from Liverpool. It was situated just down the road from ‘Mendips’. Contrary to Stanley’s memories the house did not belong to the Prime Minister. The owner, Robert Gladstone, was actually a second cousin of Prime Minister William Ewart Gladstone. That’s not to downplay his own achievements. Robert Gladstone was an important Liverpool merchant, Chairman of the Mersey Docks and Harbour Board, freeman of the city and a founder of Liverpool University. Gladstone dock on the Mersey was named after him. Gladstone’s house, named 'Woolton Vale' was built in 1869 on the site of an old tavern called the ‘Folly Vale Tavern’. 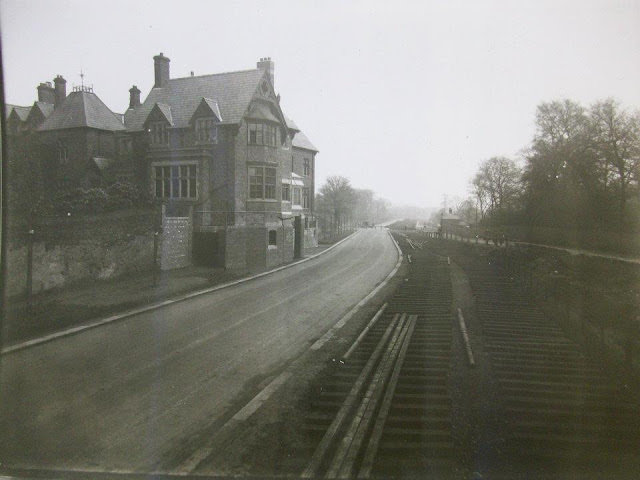 At the time the house was built the road was part of Vale Road, which was actually called Folly Vale Lane until 1870. 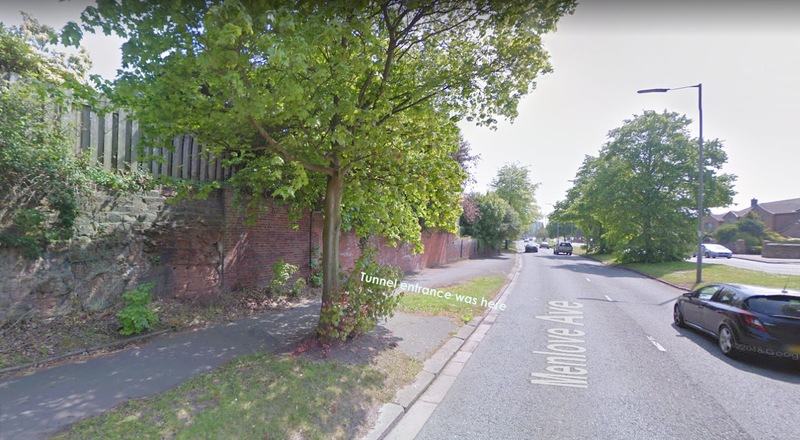 Menlove Avenue did not yet exist. Menlove Avenue on 3rd May 1924 showing 'Woolton Vale' reform school on the left. The Menlove Avenue dual carriageway was constructed in 1910. In the photo the new tram tracks are being laid which extended the tram system from Calderstones to Woolton High Street along this route. As you can see in the photo above, the pavement on Menlove Avenue actually passed under Gladstone's former mansion. Pedestrians walked through a tunnel excavated below the billiard room. Woolton Vale (according to one book it was officially the 'Woolton Country School for Boys' although I’ve found nothing to verify this) could accommodate 36 boys, some as young as seven years old, inner city kids who were there for various misdemeanours such as theft, anti-social behaviour and even truancy. 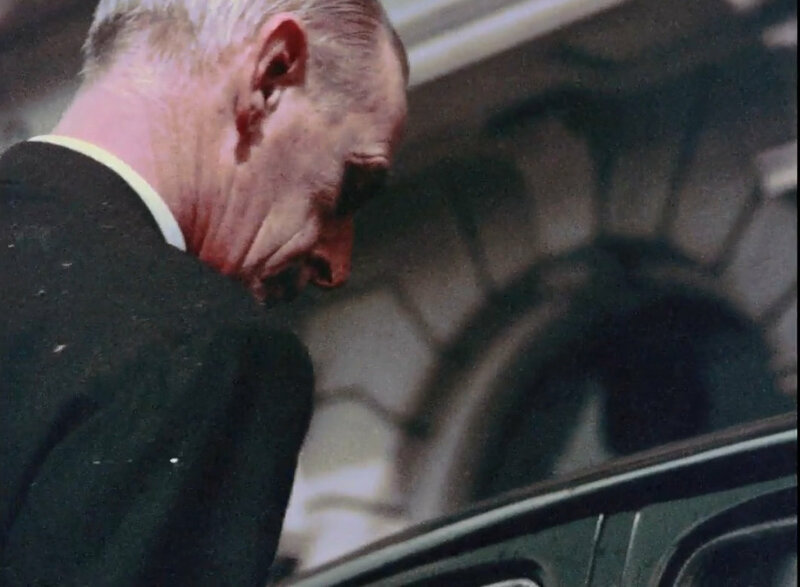 Brian Fitzsimmons: It was a remand home, a children’s home for naughty children. My Dad pointed this out to me years ago while he was teaching me to drive. Little did I know he and his brother were inmates and were given the birch while they were there. 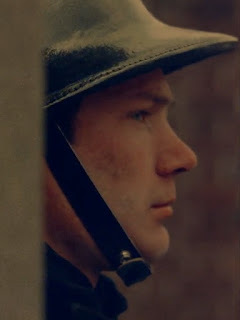 I think this was during the war years. David Dutton: I used to live near there as a child. I remember my mother telling me that is where I would end up if I was naughty! More recently, I've met some former residents and apparently it was a brutal regime there. Unlike the children at Strawberry Fields, these boys were certainly not free to come and go as they pleased, though some tried. Wearing the regulation brown shirt and short pants escapees were easily identified. Stanley Parkes: We used to chase after the boys whenever any of them escaped and went jumping all over our neighbours garden fences trying to get away. Mimi nearly had a fit whenever we attempted to chase after them. We were not to associate with such criminals! Given her apparent lack of sympathy for the unfortunate children in Strawberry Field you can imagine Mimi's view on the bad boys in Woolton Vale. It's likely the warnings David Dutton received from his Mum were echoed in 'Mendips'. No doubt Mimi shared the view of many Woolton locals who feared they would encounter gangs of marauding delinquents mugging, robbing and terrorising the neighbourhood. Little did Mimi know she already had one living under her roof. Though there are no recorded incidents of John Lennon mugging anyone he was certainly 'notorious around the village' according to one resident (my Dad). There were certainly problems with security at Woolton Vale. It was mentioned in the Liverpool Echo on 21 December 1966 and again on 5 July 1967 following a report which found that the present Liverpool Remand home at Woolton Vale was quite inadequate....(in future) security would be manned 24 hours a day and maximum security arrangements. Living in such close proximity to these two establishments it’s easy to imagine that John, himself the product of a broken home, taken into care by his Aunt because his parents were unable or unwilling to look after him felt an affinity with the rejected, unloved, emotionally damaged children whenever he encountered them. The system of remand homes and approved schools was abolished under the Children and Young Person Act 1969 and the philosophy behind the legislation represented a radical re-think of society's attitudes to problem children. (i.e that many offences committed by children were caused by a difficult home life or other social problems). The act recognised that many children were sinned against rather than sinners**, something John Lennon had probably known all his life. The site of 'Woolton Vale' today on Menlove Avenue. The tunnel was just beyond the tree in the foreground. Quotes taken from Liverpool Old Photo Gallery. Stanley Parkes quotes from an interview with Bill Harry. 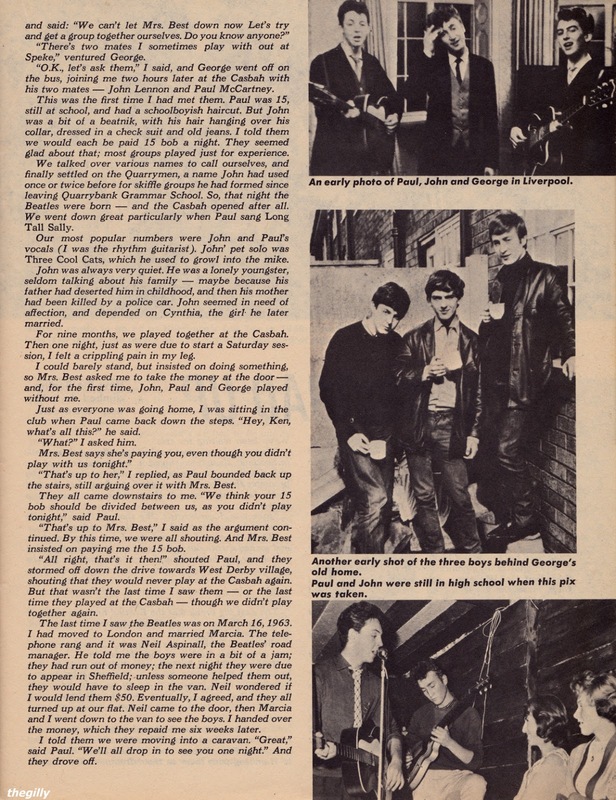 Following on from the previous blog about the Casbah Poster here's a scan of an interview with Ken Brown from 16 Scoop: Beatles Complete Story from Birth to Now, which was published in 1965. 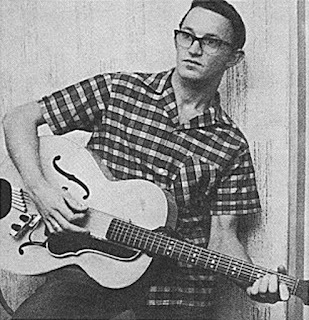 It's clear that a lot of the information you've read over the years about Brown, the Les Stewart Quartet, Lowlands and the Casbah originated in this article. I hope 2019 is good to you. One of the most rewarding things about doing this blog over the last 10 years (!) is when I receive messages from like-minded fans, historians and collectors wanting to share an exciting new discovery. Three days into 2019 we’re off to a great start with this incredible find. I opened my emails to find a message from a gentleman called Pete Howard from California. I’ve never ‘promoted’ one of my video blogs before, ever… and I have 650 now posted over the last eight years, including 40+ Beatle ones. But today’s new posting is truly mind-blowing. It’s not my poster, by any means… but I had the privilege of ‘living with it’ for a week to carefully archive and document it. Just wanted to share it with you, as a Beatles taste-maker, because it’s such a fantastic discovery. Even if you’re not into collecting paper memorabilia that much. Pete Howard was the Publisher of ICE magazine, 1987-2006 and contributing Editor for Rolling Stone magazine, 1988-1995 which in my mind give him some pretty impressive credentials. Hopefully you can watch Pete’s video in one of the links I’ve posted. If you can’t I’ve made some screenshots so you can enjoy this amazing find. This is an original Quarry Men concert poster dating from the late summer of 1959. It was made to advertise the groups Saturday night residency at the Casbah Club. It’s been suggested that it's the only Quarry Men era poster that’s ever been found (but read on). Their residency had come about almost out of the blue. The Quarry Men had not performed since early January 1959 and John in particular seems to have lost interest. George had started playing with another group, the Les Stewart Quartet who had been promised a booking at the opening night of the Casbah Club, a new venue in Hayman’s Green, West Derby. The club was situated in the basement cellar of a large Victorian House owned by Mrs Mona Best who lived there with her two sons, Rory and Pete. Mona had the idea of opening up a club for teenagers primarily so her sons had somewhere to hang out with their mates. She then hit on the idea of featuring live music, something which created a bit of competition with Lowlands, the existing club in the street (see my earlier blog) where the Les Stewart Quartet had previously played. Shortly before the opening night on 29 August the Les Stewart Quartet had a bust up. Stewart stormed out of the band and guitarist Ken Brown asked George if he knew anyone who could help them fulfil their engagement. George got hold of John and Paul, and adding Brown to their line-up the suddenly re-activated Quarry Men played that opening night and every following Saturday until 10 October when they had a disagreement with Mona Best. Ken Brown was at the Casbah but unable to perform due to a heavy cold. 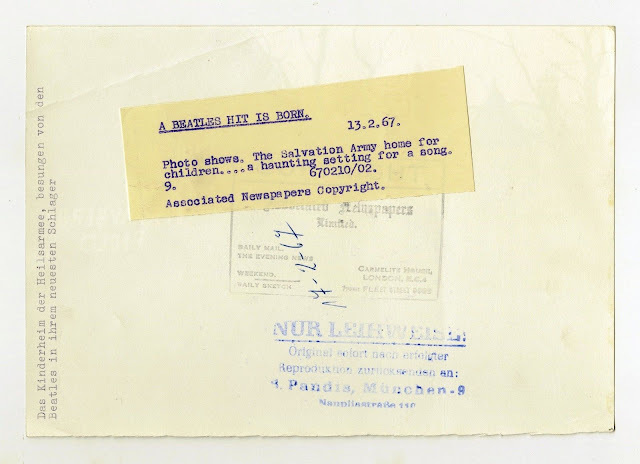 Nonetheless, at the end of the evening Mona still paid Brown his share of the group’s fee (he received about 15 shillings) much to the annoyance of Paul McCartney who saw no reason why Brown should receive payment when he hadn’t played. 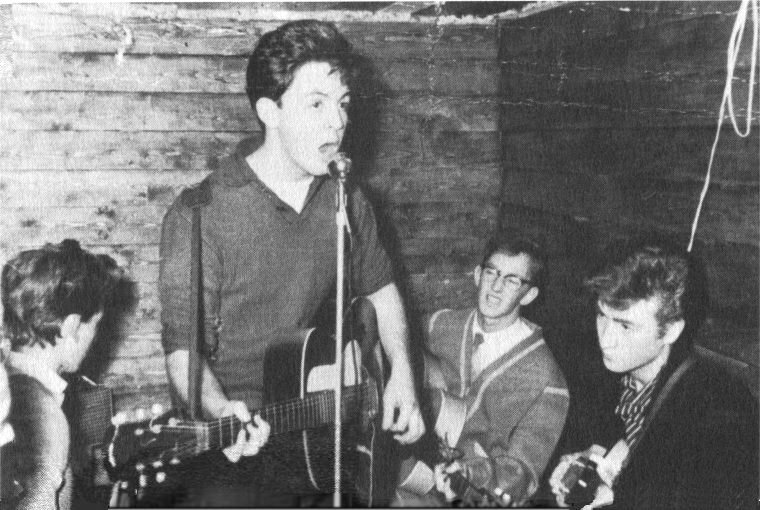 Despite being responsible for bringing Ken into the Quarry Men, George’s loyalties lay with John and Paul and he followed them out of the club. 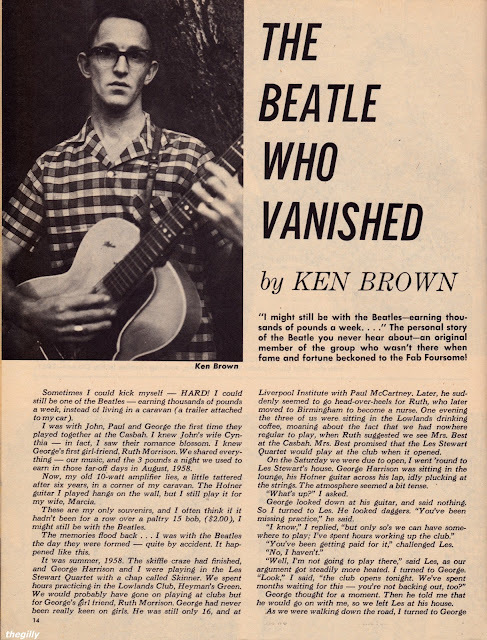 Ken Brown was a Quarry Man for no more than 6 weeks. Luckily we have photographs of the Quarry Men at the Casbah during this period including one from the opening night which accompanied a local newspaper article. From left to right: George, Paul, Ken and John. The photo below is from a different Saturday night. 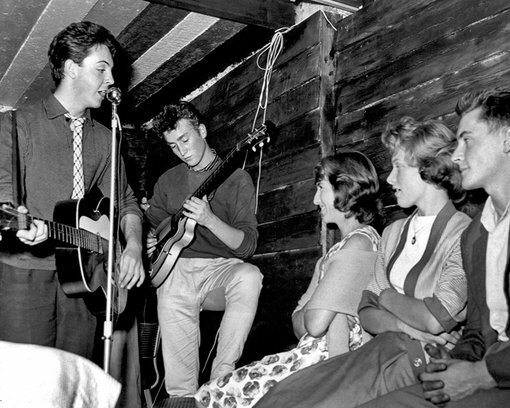 John's future wife Cynthia Powell is sitting next to John (but smiling at Paul). They were not to play the Casbah again until they returned from Hamburg on 17 December 1960 by which time they had become the Beatles and had added a drummer to their line up - Mona’s son Pete. 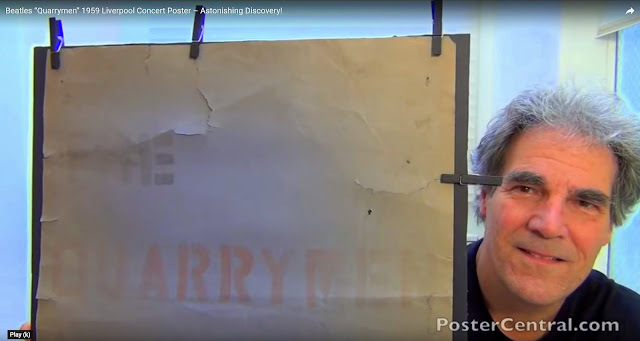 It was probably on display near the entrance to the club but as Pete Howard says in his video, as there doesn't seem to be any photographs of the club with the poster visible in the background we can only speculate where it might have been. It makes sense that the club would display the poster where people could see it so the entrance sounds like a good bet. So where does this poster come from? 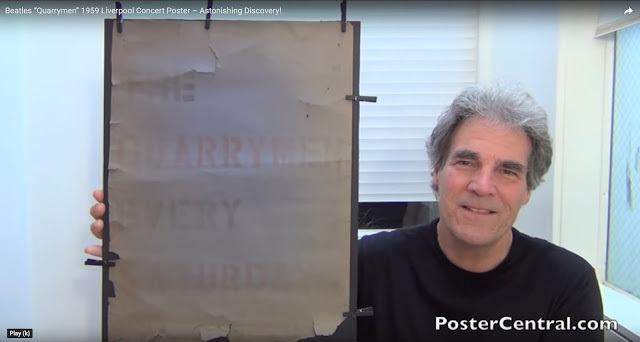 In the video Pete states the poster was obtained from the Best family. To verify the story I messaged Pete Best's younger brother Roag to see whether he knew anything about it. I was delighted when Roag replied: We have one of the Quarrymen posters on display at the Magical Beatles Museum. What this guy has is the real deal. He’s a lucky guy. So, Roag's response suggests that there is more than one Quarry Men poster in existence. I personally don't recall seeing a poster for the Quarry Men (or Quarrymen for that matter)* at the Magical History Museum when I attended the opening, but that's not to say there isn't one. For now, here's a later Casbah poster (presumably for the aforementioned 17 December 1960 engagement) used in Pete Howard's video for comparison purposes. Like the Quarrymen poster it’s been stencilled, probably using the very same stencil. It's truly an amazing discovery. I can only guess what it might be worth to a collector. 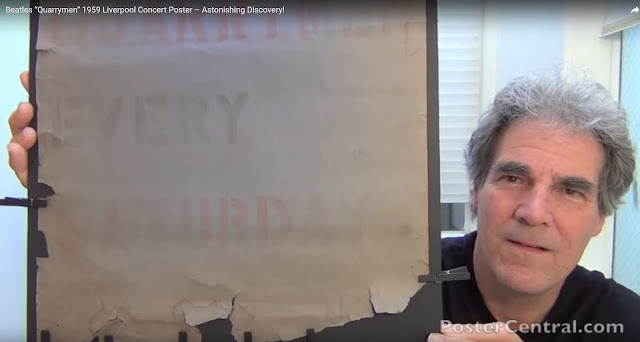 As Pete Howard says, the condition doesn’t really come into it - how many cigarettes were smoked near this poster before it was kept in storage for decades? We're lucky it survived and we have had the privilege to see it. Thanks for sharing this with us Pete. I hope you inspire others to get in touch with their own unique items. * Were they the Quarry Men or the Quarrymen? None of the surviving members seem to agree. 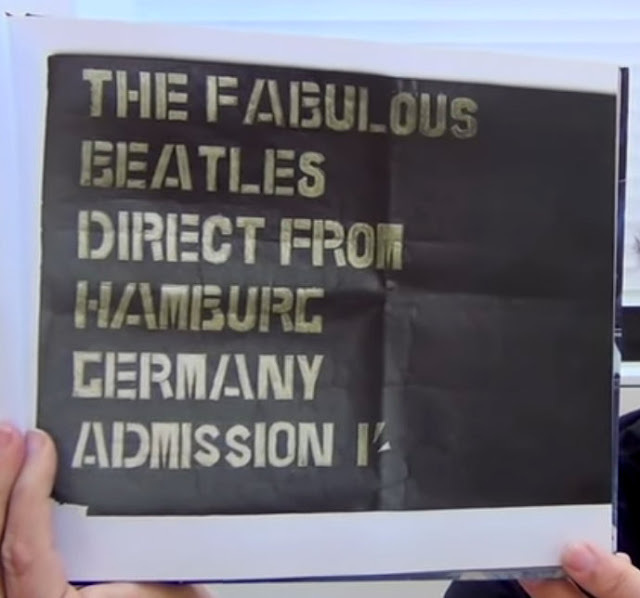 Drummer Colin Hanton's recent book 'Pre-Fab' uses the two word spelling, as does the recognised authority on the Beatles, author Mark Lewisohn in his book 'Tune In'. I've followed suit. The poster may support the argument that it was actually one-word, may have been stencilled by a non-band member who didn't know, or may simply have been written this way to fit the dimensions of the poster. I guess we'll never know.